I’m not a tennis person but I’m loving a lot of these tennis capsule photos. 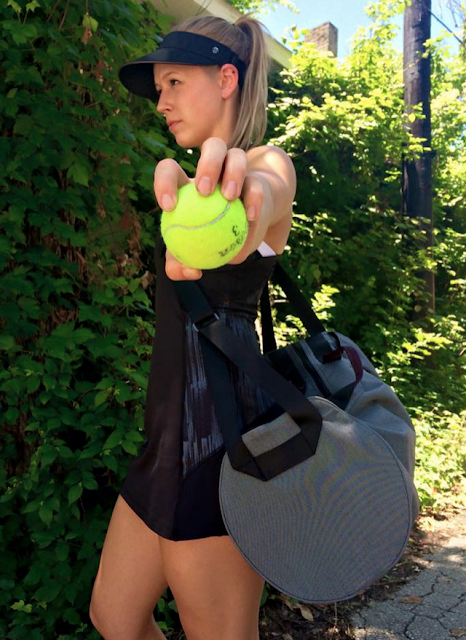 This years tennis by lululemon is on point! "Pleat To Street Skirt, Miss Misty Jacket, Superb Long Sleeve Tee and More"
Cute but no way is that skirt golf appropriate length! Wish it is a tad longer. I was so surprised at how long the dress actually is – not any shorter than the hit your stride skirt, rival or pleat to street — The back of the dress actually seems like it is longer than front to account for the bum. I was very impressed. From the side it is soooo flattering. I have a bit of a mummy tummy ( a thicker waist) and it made me look so thin on waist from side view. I got both colours – that is how much I liked them. I didnt think I would like black, but the pattern has a slight shimmer to it and it is not on the flounce part of the skirt/dress – so I thought it looked better than the skirt. The fabric is amazing too! It wasn't meant to be a dress to wear out (I buy my casual/work clothes from other retailers) – I wear LLL for the gym only (or jogging/walking). So this baby will suit my needs fine. Cute for a pump workout or for a jog! And if I happen to have to run into grocery store, its all good – I will have short underneath – no different than wearing any of my other skirts from gym when running into grocery store!